With wide use of biomass in various industries and enterprises, large amounts of biomass waste are being produced. This causes severe environmental issues and inadequate utilization of renewable resources. In this work, a sustainable and green process approach is proposed to utilize lignocellulosic biomass residues from biofuel conversion proceeding via direct mechanical treatments. 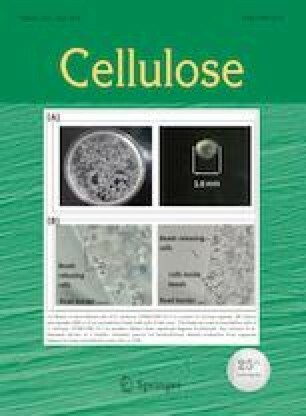 The obtained nanofibers containing cellulose, lignin, and hemicellulose were directly isolated from lignocellulosic biomass residues and had diameters of approximately 21 nm. After being treated via ultra-micro grinding for 0.5 h with a millstone gap of approximately 5 μm, and undergoing ultrasonication for 20 min at 1000 W as well as high-pressure homogenization shearing for 15 times in a chamber with 87 μm diameter, partially hydrogen and covalent bonds between cellulose, lignin, and hemicellulose chains could be broken down. Lignin and hemicellulose were wrapped around the cellulose bundles, thus the residue nanofiber aerogels became easy to redisperse and redry in water. Additionally, the specific capacitance of carbonized nanofiber aerogels was up to 73.2 F g−1 at a current density of 1 A g−1. A remarkable reduction of specific capacitance happened along with the fermentation process prolongation and which is mainly related to the fermentation degree. With characteristics, such as special composite texture, high specific surface area, and excellent electrochemical performances, lignocellulosic biomass residue nanofibers displayed positive attributes in terms of energy storage and nanomaterials. The online version of this article ( https://doi.org/10.1007/s10570-019-02333-z) contains supplementary material, which is available to authorized users. Liu Liu and Xiaojun Sun have contributed to this work equally to this work. This work was financially supported by National Natural Science Foundation of China (31530009, 31500476, and 31890771), National Key Research and Development Program of China (2017YFD0600804), Young Elite Scientists Sponsorship Program by CAST (2016QNRC001), Outstanding Innovative Youth Training Program of Changsha (KQ1707019) and Hunan Provincial Technical Innovation Platform and Talent Program in Science and Technology (2018RS3092, 2018WK4028, and 2016TP1013).